The Nigerian Army has propelled a manhunt for leader of the Indigenous People of Biafra (IPOB), Nnamdi Kanu, scarcely 24 hours after the group's prohibition. Kanu's whereabouts are unknown since the prohibition was reported. The IPOB leader is on bail for claimed treachery charges leveled against him. The Nation reports that his bail sureties, may be asked by the security organizations to represent him. Additionally, security offices are examining Kanu's affirmed foreign connections. Investigators are said to be breaking down a video clasp of Kanu and a Turkish citizen as a major aspect of the test. "Troops have been given a firm request to angle out and capture the IPOB leader. As a prelude to it, the Defense Headquarters on Friday announced IPOB as a terrorist association. "Knowledge has, in any case, uncovered that Kanu may have gone underground. As I talk with you, troops have really looked through his house and he was not discovered there.Troops have a mandate to capture him wherever he may be," a source said. Inquired as to whether he is not discovered the source stated: "We may take after lawful process by considering his sureties mindful. These sureties should create him." 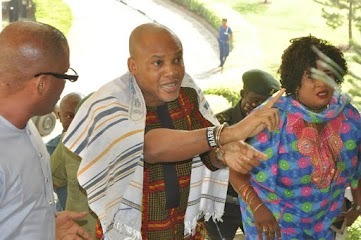 On the test of Kanu's affirmed foreign connections, another source stated: "We are investigating the assertions of foreign help for Kanu. We are doing a profiling of his foreign contacts. We have a few intimations however we have to burrow further."